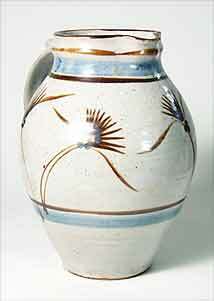 Danlami Aliyu jug - 9½" (241 mm) high. Danlami Aliyu started his potting career at the Abuja Pottery in Nigeria. He studied at Farnham School of Art from 1976 to 1979 and then at Wenford Bridge under Michael Cardew. In 1985 he set up a pottery at Maraba, also in Nigeria, with the help of Michael OBrien. Later, again with the help of OBrien, he started another, Al Habib Pottery, at Minna. His younger brother Umaru is now in charge of Maraba. 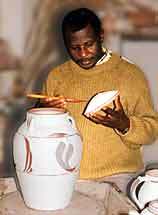 Danlami is Nigeria's most prominent living potter, second only in recent times to Ladi Kwali. He regularly exhibits in London.